Today has been a lovely day of doing bits and bobs and pottering around the house and eventually when the weather sorted itself out we got in the garden. Also my Dad and The Mister and my brother-in-law went to collect a knackered Wendy house which needs fixing up, painting and making glorious! You can just see it on the left of this photo, although it actually goes on a platform about 4 foot up. They managed to bring it home upside down in Dad’s trailer which was hilarious. 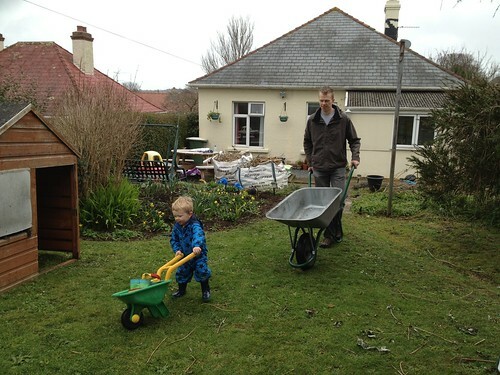 The Little Mister had a wonderful day and he especially enjoyed riding in Daddy’s wheelbarrow and then when we remembered we had a little kids one in the garage he enjoyed pushing his own ‘barrow’ about. Two years old is such a challenging age at times but he is completely awesome and he makes me laugh so much. My best boy. 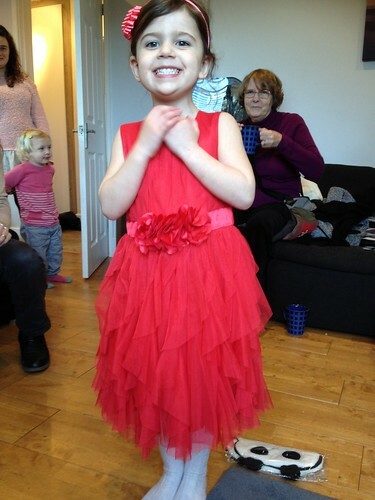 Today our gorgeous, funny, opinionated and sparky niece was 4! She had a wonderful day and a party with lots of her family and here she is wearing the dress that we bought her as a present. I have had a couple of days of not feeling very well as I have had a tummy bug. I quick snapped this photo on the way home from picking the kids up. 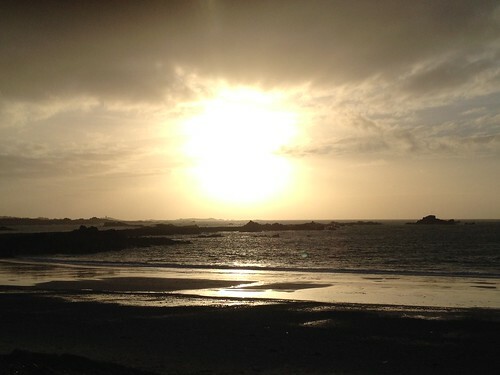 Glorious Guernsey. Whatever the time of year! 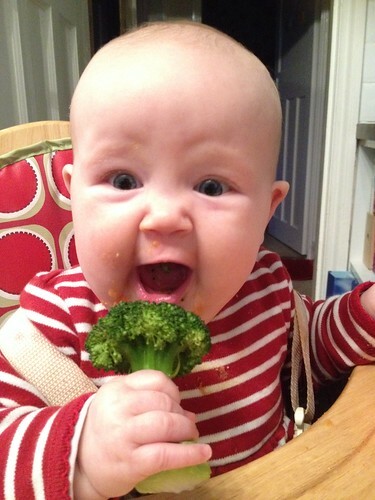 Weaning is going well and we have only had a few scary choking moments. I remember with The Little Mister that some mealtimes took nerves of steel but we got there eventually. Love this baby stage. In fact I love all the stages so far. 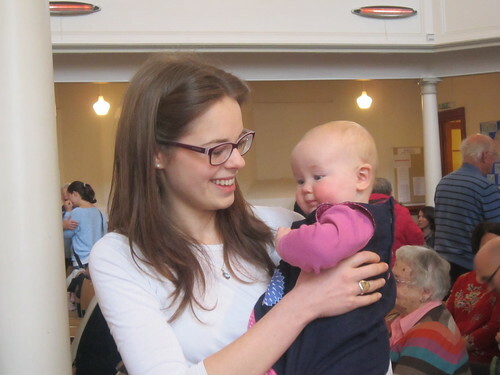 My lovely friend Yasmin came to The Little Miss’ Christening and took some photos. 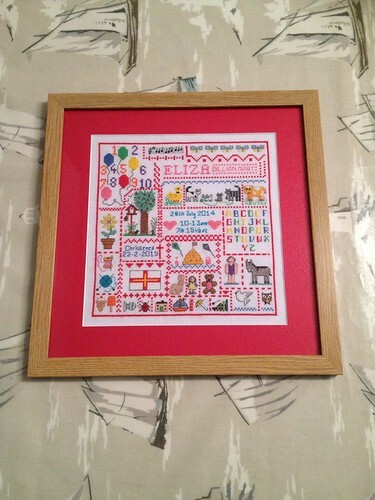 My mother-in-law made The Little Miss this gorgeous sampler for her Christening present. She had already made The Little Mister one and I think they are fabulous. She has made our children such lovely presents and I am very grateful for them. Keepsakes like this are wonderful! 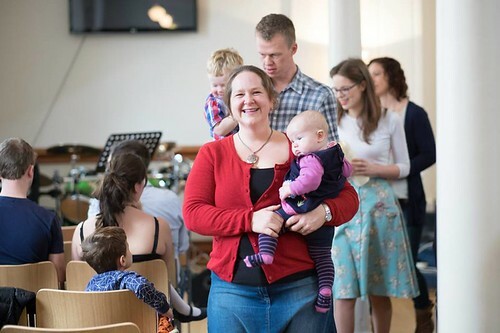 The actual formal bit was in the first part of the normal church service and our daughter was welcomed into the church family and the congregation made promises to her and to support and encourage us as a family. The Little Miss has two wonderful godfathers and two wonderful godmothers, my sister and my cousin Stefi who is pictured here with her. I am so very grateful for all these people who surround us and love us and promise to be with us in our parenting journey. Of course the day was tinged with sadness (and more than a few tears from both me and my sister) at the thought that Mum wasn’t there with us, especially as The Little Miss has her names as her middle names. In a weird way though when her full name was spoken out it was a little like Mum was there. In speaking out her name we made her right at the centre of the event. Her importance in our lives continues and I miss her so very much. Saturday was a great day. Spent some time in the garden pruning back the bushes and in the evening I went out for dinner with three of my very good friends who haven’t seen for ages! These two wonderful guys in the picture are the very lucky Little Miss’ godfathers. I have known them a long time. 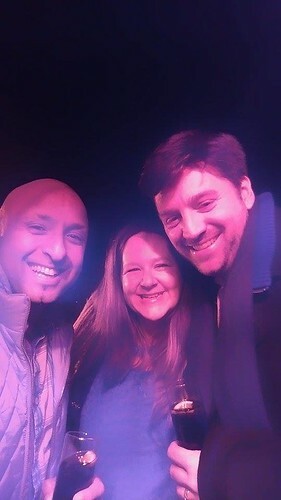 We have been through so much together and I know they will do the godparenting things properly. They will pray for and support my daughter and buy her wonderful presents! The weather today has been dire. Really wet and miserable which is why I dragged us all to town where we got soaking wet! 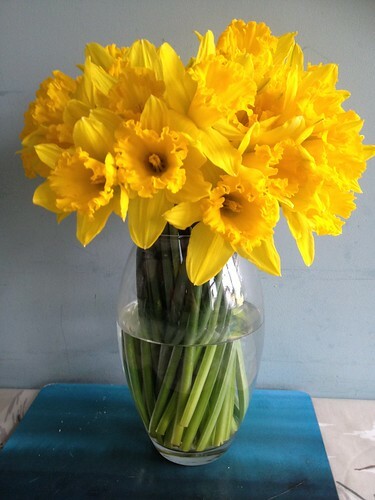 So I thought I would cheer myself up with these gorgeous daffodils. They are so bright and cheerful and they made me smile. My in-laws arrived for The Little Miss’ Thanksgiving service which is happening on Sunday. As usual they arrived bearing carrier bags full of clothes for the kids (who knew Morrisons had started doing such nice clothes?!). 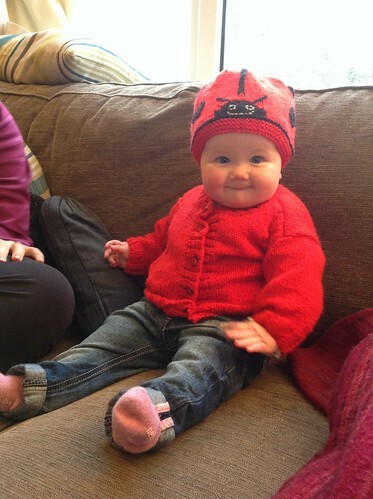 My mother-in-law has made The Little Miss this fabulous red cardi and matching hat. She looks thoroughly pleased with them too!